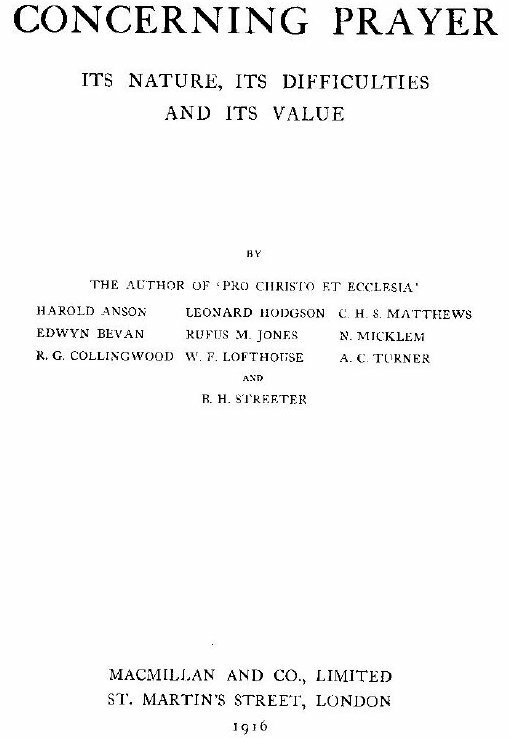 Harold Anson, Leonard Hodgson, C.H.S. Matthews, Edwyn Bevan, Rufus, M.Jones, N. Micklem, R.G. Collingwood, W.F. Lofthouse, A.C. Turner, B.H Streeter. 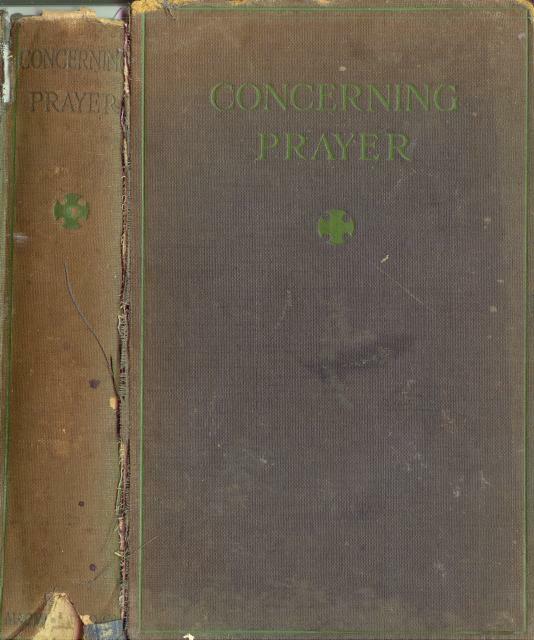 In this volume a lady, three laymen, two parish clergymen, two clerical dons (all Anglicans), a Wesleyan theological tutor, a Congregational minister, and an American professor belonging to the Society of Friends, put forward some thoughts which are the result of a sustained corporate effort to clear up their own ideas on this important matter. Most of them have been able to meet regularly at a series of conferences in which subjects were discussed, and essays previously drafted were frankly criticized, to be rewritten and again discussed at later meetings. Besides the actual writers of the essays, the conferences were regularly attended by Miss M. E. Campbell, by whom the Indices have been compiled, by Miss M. S. Earp and occasionally by other friends, whose presence contributed a valuable element to the discussions. That so many fellow workers in such a field, approaching from so many different points of view, should have reached unanimity on all these subjects was not to be expected. All through they have endeavoured neither to establish nor to defend positions but simply to follow truth, and in seeking truth together each has learnt much from others. But differences of opinion, even on important points, have not entirely disappeared. Each writer is therefore finally responsible only for what occurs in his own contribution. The writers are under no illusion as to their personal competency to plumb to the depths the great matters which they have essayed to treat. But frank discussion between men and women inheriting different religious traditions, and mutual criticism in an atmosphere of corporate devotion and spiritual fellowship, seem to help the individual to a wider and deeper vision than he would be capable of attaining alone. Believing therefore that they have themselves learnt much, they hope that they may be found to have something to offer to others who in these days are feeling the perplexities of existence, to help them to lift up their hearts with a greater confidence towards the Source of all light, of all power and of all consolation. CUTTs END, CUMNOR, Feb. 1916. - B. H. S. L. D.